What's New? by Tim Finkle: Here we go again! April is just a few days away and annually that is when we consider the "Spring Rush" to begin. The ice on Lake Erie will soon be gone and boats will start to launch. We always wish it could be sooner, but patience is required in this climate when we are talking about weather. There is a lot to do in a short window of time and we know once the sun shines, our customers want to use their boats! There is a lot in this issue since I missed last week, so I will get right into it with an update on our inventory for 2019. We try not to make this all about boat sales, but this time of year it is important to share this information with our customers who may be looking at a new boat or want to know what is available. If you have any interest in finding out more about any of these models, please reach out to the broker in your area. Our Stock Boats here now with More Coming Soon! 2018 Beneteau 38.1 in Buffalo - White Hull, 3 Cabin, Light Oak Interior, Bow Thruster, AC/Heat, B&G's, Canvas,etc. 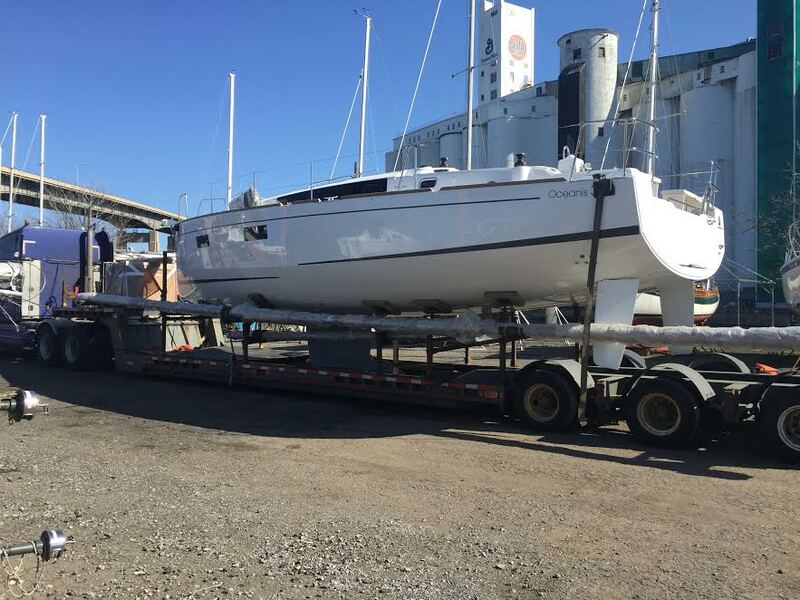 2019 Beneteau First 18 arriving in May and traveling our territory - Triad Trailer, Motor, 5 Sails, Super Fun Sport Boat! 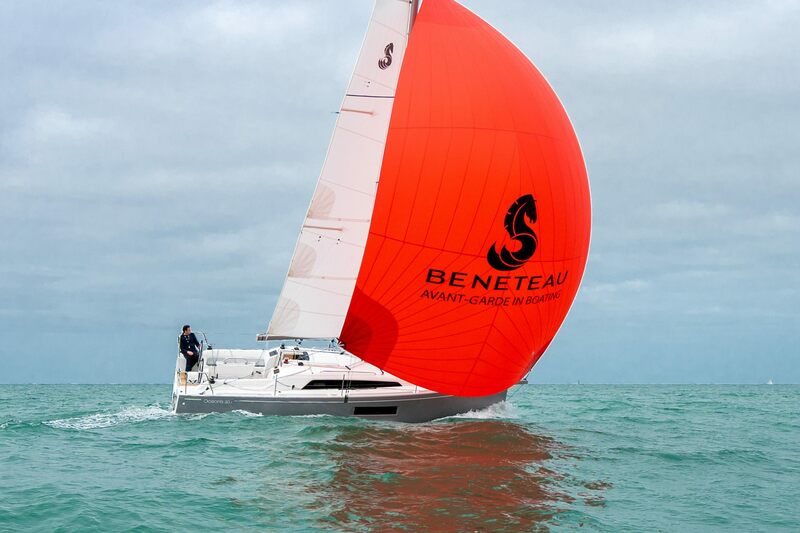 2019 Beneteau Oceanis 30.1, July - The newest model and only one for this year. See review further down in this newsletter. 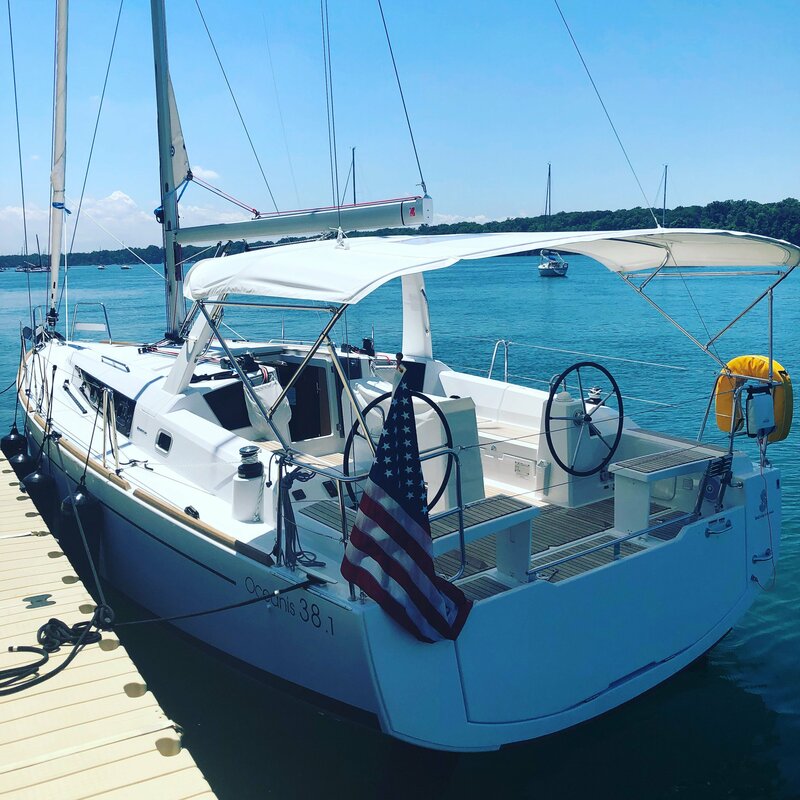 2019 Back Cove 32 in Youngstown (inside) - Blue Hull, Volvo Diesel, Bow & Stern Thrusters, AC/Heat, etc. 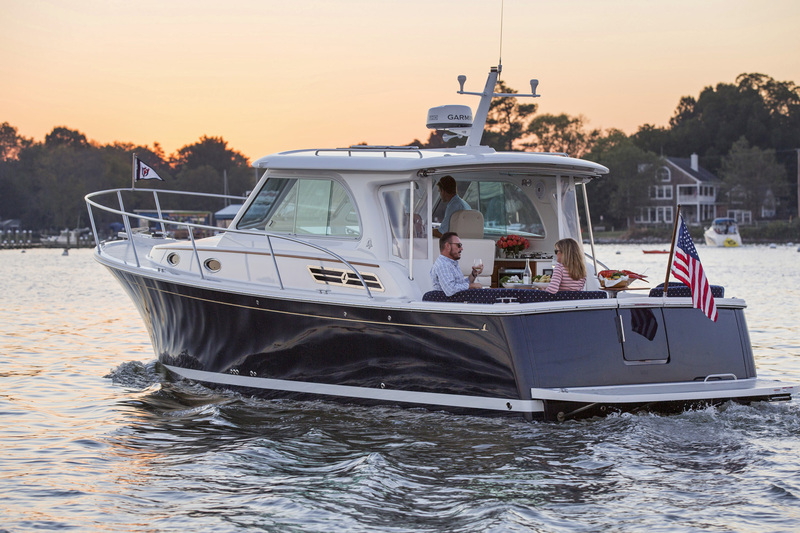 2019 Back Cove 34O first one arriving in May to Rochester and second in June to Buffalo- Twin Suzuki 350HP with Joystick control, Blue Hull, Teak Swim Platform, AC/Heat cabin and helm deck, Generator, Simrad Electronics, Ultraleather seats, and A LOT more. No Such Thing as a Volunteer Today: If you belong to any boating club or association you are well aware that most of the work is done by people who are commonly called volunteers. However we feel term that is now a misnomer. Very few people step forward and raise their hands and say "give me a job". At the same time it is becoming more difficult to find people to do the work because we are all so busy. We see those in charge growing increasingly frustrated by lack of help. There is an answer. People like to be asked. If you send out an email asking for volunteers you will get dead air in return. On the other hand, if you make a personal call, or better yet a face to face request, you will find people will agree to help out. The simple fact is that people like to be asked. Mark your Calendars: Did you get out on the water often enough last summer? We didn't think so. There is a solution and all it requires is a calendar. Dig it out now and start marking when and where you want to go sailing or boating. For racers this is easier, just take the race schedule and fill in the dates on your personal calendar. If you are a cruiser make sure to mark in those weeks or weekend trips you want to make but couldn't find the time. Tell everyone else you are going and make it known. If you say you'll go when you have time we both know that won't happen, there will always be something else coming up. The real culprit is letting others drop something on you at the last minute. If you ahve firm plans you only have to tell them you aren't available. Don't let others dictate your time, you only have one life to live! 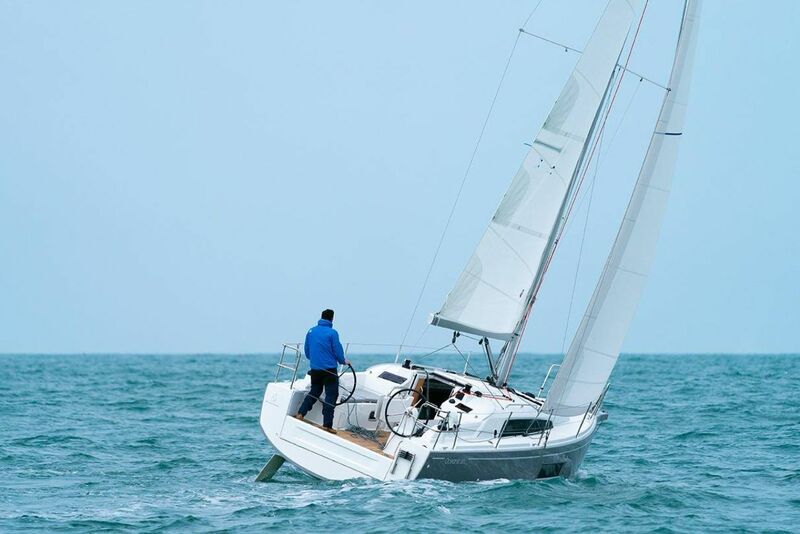 Beneteau Oceanis 38.1, Our Best Selling Cruiser, by Don Finkle: We absolutely love this boat, and for the last four years we have been using one ourselves as a demo. It is a wonderful platform for cruising, daysailing, entertaining and swimming. Our grandchildren have learned to love going on the boat which makes it much easier for us to get the family all out on the boat together, seldom is an invitation turned down. The best cockpit in class, in fact better than you would find on most boats much larger. This is where most of us spend the majority of our time on the water and the Oceanis 38.1 really shines in this area. Twin wheels with seating for the driver aft and aside, long bench seats P&S, huge table, low coachroof for great visibility forward, all lines led to the cokcpit for ease of handling, and easy movement within the cockpit. It is hard to imagine anything better. One would also be hard pressed to find a better swim platform which folds down very close to the water for ease of access. The kids go up to the foward cabin and play with their toys, they can't fall out of the bed because it goes right to the hull sides. They love to look out the large hull ports and we don't have to worry about them. Adults enjoy the wide berths, commodious head compartment, excellent headroom, comfortable salon layout and so much more. 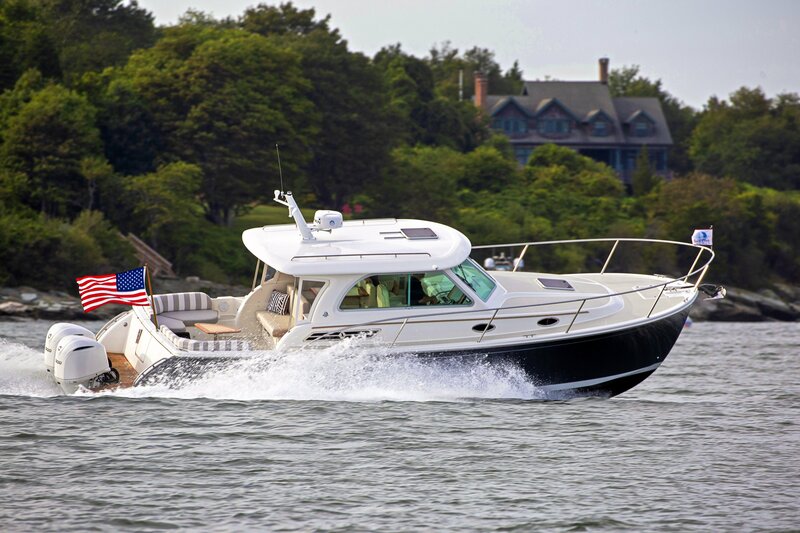 Stability is excellent due to the chine hull, and twin rudders provide solid control. April 10, Ullman Sails/RCR Buffalo Sailing Seminar: Greetings Buffalo Sailors. We have moved the next Ullman Sails/RCR Yachts Sailing Seminar to April the 10th so as not to conflict with the Buffalo Harbor Sailing Club monthly membership meeting on the 17th. You will want to attend both I am quite sure. Dan Elliott from Ullman Sails will present material on sail trim. “A Birds Eye View of Your Sails”. We’ll talk about main, jib and spinnaker trim. How to set headsail leads correctly fore and aft and inboard and outboard. Halyard tension. Headstay sag to correctly match your sail. Power up…….Power down. Mainsail trim. Halyard setting. Outhaul. Leech profile. Traveler positioning, Cunningham. All of this as it relates to draft position and correct sail trim for different wind and sea conditions. Spinnakers, symmetrical and asymmetrical. Learn to fly it more effectively in light air and carry it further up in the wind range. Choose the right sails for the conditions you’re sailing in. 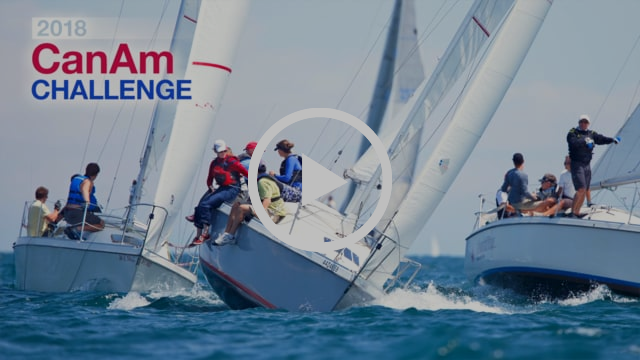 Mike and Darren from RCR Yachts will bring insight into the various parts of hardware and running rigging associated with trimming your sails. Halyards, stoppers, sheets, vangs and other tackle you’ll use trimming sails. Questions, comments and snide remarks encouraged. Refreshments provided. A good time guaranteed. See you April 10th at 7:30 at the Ullman Sails Buffalo loft. 433 Broadway. Buffalo, 14204. Parts? For those looking for used sailboat parts. We are starting to list some used/new overstocked sailboat parts on ebay. If you are looking for something specific, email darren@rcryachts.com and i will take a look through our inventory. We have a wide assortment of stuff, so don’t be shy in asking. Something I’ve been putting off for way too long, cleaning out the basement of all my accumulated stuff. With the cold, snow and windy days we’ve been a bit house bound, so why not tackle the job before the boating season starts? I never really thought of myself as a hoarder or pack-rat of any type but, it seems I’ve collected lots of assorted stuff over the years. Not wanting to do a total search and destroy mission and call in a dumpster, I took on the challenge. It seems there’s an accumulation I’ve collect from my years of making jewelry, playing ice hockey, sailing, collecting antiques and other assorted collectibles. The problem with going through all this stuff is the memories it brings back of when and how I acquired it. I found my old boy scout merit badges, neckerchief slides which are not worth very much at this point. Just holding it again reminded me of when I went to scout camp and earned all the waterfront badges; rowing, canoeing, kayaking, swimming and lifesaving. There was also knot tying and a tote-n-chip card; needing to carry a knife or hatchet when camping! Excellent training for sailing too or for going in the army which is really what it was for back then. Good memories but, what to do with them now? The time I spent in scouts did prepare me for being on the water and the skills I needed later in life, funny how it works that way? I found my sketch books when I was designing jewelry from 40 years ago. Must have been a dozen or so. The small books were also my journals with writings of what was going on in my life at that time. What the kids were doing, who I was dating at the time, events in the world and so on. 40+ years was flashing by as I skimmed the pages. It seemed that every few pages were another sketch of a sailboat, sunset, a guy fishing, a quick drawing of a lighthouse, bird or anchor. Many of these were made in items of jewelry for clients but, some were just doodles. I’ve passed all my jewelry tools to a young lady who can continue enjoying them. She’ll be better at it then I ever was. I’m keeping the journals for now. I found hockey and sailing awards from over the years. Each brought back more memories of the teams and people I played and crewed with and the fun we had. What do you do with all that stuff? I have wooden hockey sticks and leather skates, antiques by today’s standards. Even my golf clubs are from another age it seems! Old photos are the hard part. Nowadays it’s all digital on the computer, who keeps old photos? They’re piled up in a shoe box collecting dust. I found collars from pets I’ve had that have passed on. Looking at all this stuff I’ve saved as the years went by, it seemed like just yesterday the kids were learning to skate, now they have kids of their own. When I stopped making jewelry 16 years ago and joined RCR Yachts, it is the dream job. I remembered coming to the marina on my first day, walking through the assortment of boats each with different keels, masts and colors. Walking up to them and feeling the shiny fiberglass hulls and smiling that I was in my element; close to boats and the water. What made the job even better was talking to people who have the same affliction as I do! Some have it worse, some just a little but, we all suffer from the same need to be around boats and be on the water. I think it’s a control thing. We are on our own, going the way we want, no one telling us where to head or how to trim the sails. The get away from it all dream that sailing offers. I don’t think of myself as a boat sales person but, more of purveyor of dreams; assisting those who suffer from the same obsession, the need to be on the water. We call this living the dream, buying a boat and sailing off into the sunset! Cleaning out the basement of all the accumulated memories is not so easy to do. There’s so much there and each has a special meaning to a place and time in the past. It’s very cleansing mentally to move on and move yourself to the next phase. My kids don’t need or want the stuff, it only means anything special to me and I haven’t used or looked at it in years so why hold on to it? As I’m throwing out the old stuff, I realize it’s the memories they bring back, a place in your mind where we go to for the thoughts of good times with family and friends. The stuff we hold on to is only the vehicle we took to get to those memories. I’m keeping some of it and some has been given away or tossed. All these memories reminded me that time is the one thing we cannot control. It passes so fast and the older we get, the faster it seems to fly by! We’ve said it here before, QTR-quality time remaining. Some of us have more years behind than ahead. What are you going to do with it? I plan to be on the water and enjoy the QTR. The rest of the junk in the basement can wait for another day and there’s still plenty of time to make new memories! See you out there living the dream! Back Cove 34O taking speed and comfort to a new level. 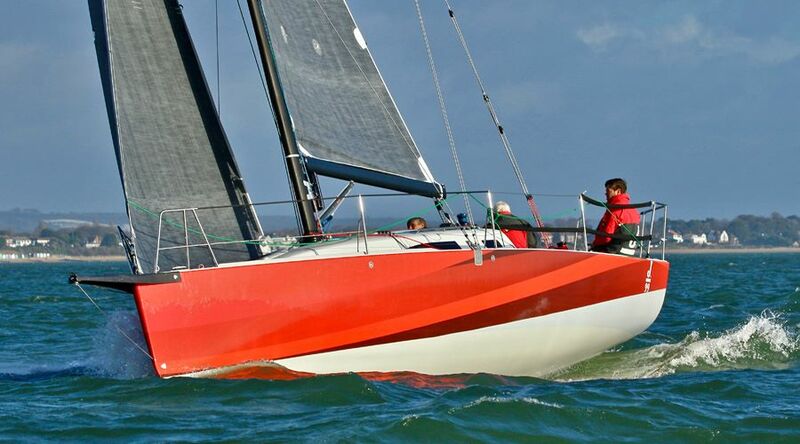 Here is a very interesting 30-footer—its actually 29 feet 6 inches—from Beneteau for its Oceanis series. The design is by Finot-Conq with an interior design from the Nauta Design studio. This boat exemplifies the current trend to fill the entire hull with accommodations. A few years back you could not dream of an interior layout like this on a 30-foot boat. Granted, the overall look of the 30.1 is a bit boxy, but that’s what you’d expect when the designers are trying to create the biggest box they could in 30 feet. I find it quite good looking in the European contemporary style. Obviously to get a big box you need beam and the 30.1 has 9-foot 10-inch beam for an L/B of 3. There is no taper to the plan view aft. Max beam is carried to the transom. Again, in order to maximize the box, the transom has no camber. The sheer is a dead straight line, but spring would reduce interior volume. There is a chine aft that provides the interior volume for a big double quarterberth and it adds some stability when immersed. There is a shoal keel drawing 4 feet 3 inches with a stub keel and 6-foot 2-inch deep keel with a bulbed, short-chord fin. Twin rudders are a big help when you want to reduce draft. Both keels are cast iron. Using the specification’s “light displacement” I get a D/L of 171. This interior is impressive. Yes it’s tight but it’s all there. The aft double berth is big and has a hanging locker forward of it. The forward cabin takes advantage of the plumb stem and shows a more comfortable than usual double V-berth. There are two hanging lockers in this space. The settees in the main cabin look a bit narrow to my eye. This works when you are sitting up at the dining table but if you want to relax, I think more depth to the settee top is required. The starboard settee is truncated aft to make room for a small nav table. All you need now for nav gear is a laptop. The head is big, but the galley is not big. But on a 30-footer you would not expect a big galley. The sailplan uses a square-topped mainsail. This means there is no backstay. Instead, the spreaders are raked by what I measure as 38 degrees. That is a lot. You won’t sail downwind wing-and-wing. Instead you’ll reach and jibe, but that’s the way to get the best VMG anyway. The jib is self-tacking. Using 100% of the square-topped mainsail and the self-tacking jib areas I get a SA/D of 16.28. 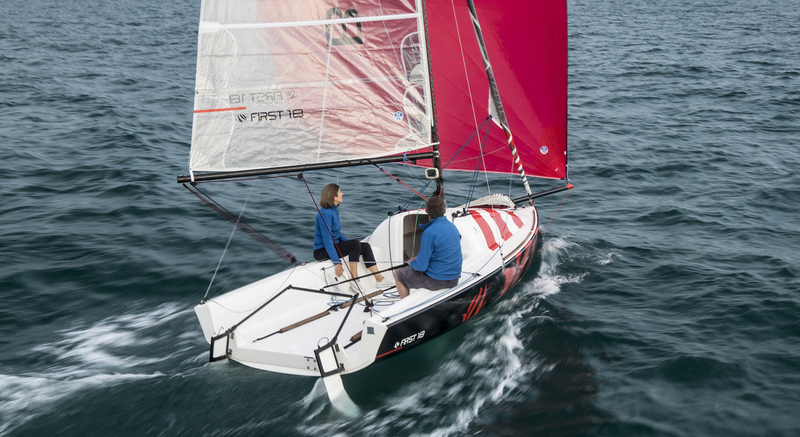 In addition to the self-tacking track there are deck tracks that would allow you to carry an overlapping headsail that will enhance light-air performance. The wide stern really shines when it comes to cockpit design. Just think of this area compared to what you would have had on a 1970s IOR half-tonner. There is no comparison. The twin wheels open up the stern for boarding. There is a drop-leaf table for dining. The cockpit seats look long enough for a nap, but are slightly narrow. All the lines are lead to port where clutches are lined up. There are only three winches on this boat. If you plan on racing, there could be times that your spinnaker handling could use an extra set of winches aft. But I don’t see this boat as a race boat. Side decks are minimal but workable. There is a flush anchor locker forward. Beneteau has packed a lot into this boat. In the 30-foot class in the “Race for Space” this might be the winner. LOA 31’3”; LWL 28’5”; Beam 9’10”; Draft deep 6’2”, shallow 4’3”, lifting-keel 3’1” to 7’8”; Displ. 8,805 lb. ; Ballast deep 2,144 lb., shoal 2,535, lifting 2,865; D/L 171; L/B 3; SA/D 16.28; Fuel 34 gal. ; Water 42 gal. ; Auxiliary 15-hp standard, 21-hp optional.